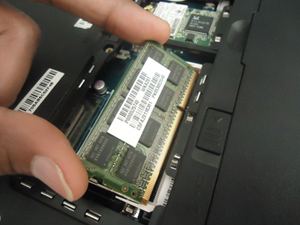 How to install laptop memory? My laptop is running low, how can I speed up its performance? One way is to install laptop memory. And there are other several ways, but memory upgrade is the fastest and the easiest. Follow the following steps to install additional memory on your laptop. Frequent low virtual memory message, new programs installation failure, slow computer program loading and file opening are the most common indicators for low memory space in your laptop computer. 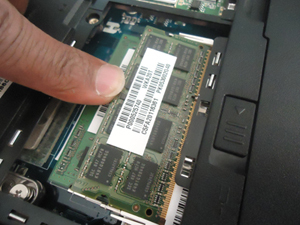 -	Purchase the memory chip from online store; browse laptop memory here. 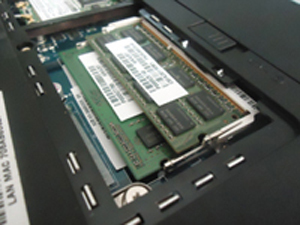 -	Consult your laptop manual for additional help about the installation of your laptop memory. Read more about computer memory here. Turn off laptop, unplug AC adapter, remove any cables connected to the laptop and locate the place of the memory compartment on your laptop On most laptop brands (Toshiba, Dell, Compaq) memory box is located at the back of a laptop. 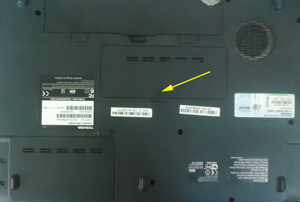 You will also find memory module case under laptop keyboard, mostly common for HP laptops. Read the user manual come with the laptop to identify the place of memory box. Locate the memory case and using simple Phillips screwdriver unscrew memory module case cover and put it at separate place. 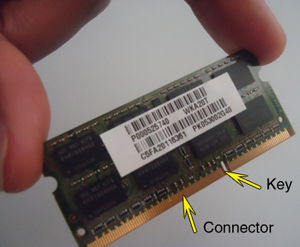 Depending on the model of your laptop, memory modules are arranged either side by side or stacked on top of one another (as shown in following picture). So, if your laptop is arranged on top of one another, you should remove the top memory to install the bottom memory module. To protect possible memory damage, you have to discharge static electricity from your body by touching a grounded metal surface. Pick up the newly purchase memory module by its side and position the module to the slot by aligning the connector’s notch with the connecting key in the socket. Press firmly the memory chip into the slot’s socket at approximately 30 - 45 degree angle. After inserting the memory module fully into the socket, slightly press the upper part of the memory to seat it into the latches found at both side of the socket. When you press the memory, the latches should return back into place securely with the corresponding cutouts in the side of the memory chip. Once you finish installing and screw back the cover, power on your laptop and check whether the laptop recognizes the new chip and the memory size is increased. Go to the Start menu and click Settings--->Control Panel----> System and then select the "General" tab. At the bottom of the page you will find the amount of memory installed. signals Continuous beep - the memory is not properly installed or malfunction chip Size is unchanged – the type of memory used is not compatible with the laptop.